With lingering tensions in the South China Sea, uncertainties have remained in the Sino-US relationship. Where are bilateral relations heading? How can the two countries cooperate to reduce divergences and enhance mutual trust? 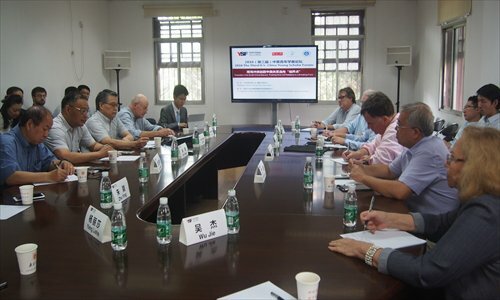 During the just concluded Third US-China Young Scholars Forum in Nanjing, East China's Jiangsu Province, co-hosted by the Carter Center and the Global Times, scholars from both China and the US shared their views on these issues. When I was a student, most graduates saw the US as a "holy place" for further education. One of my friends in Shanghai sold his apartment to go to the US. Recently, he came back with $1 million, but the apartment he sold is now worth 100 million yuan ($14.99 million). China's house prices have already caught up with those of the US, but China still lags behind the US in many areas. China has built many military planes, but we are still unable to manufacture advanced engines and must therefore depend on cooperation with foreign companies. The gap between China and the US is still huge. But in public opinion, the bilateral relationship is very tense, as if there will be a war in no time. I don't understand why the US is so concerned about China and what has made the two sides become vigilant about each other. The US-China relationship is the world's most significant bilateral relationship. China and the US can set an example for the world to focus on peace and development. The number of US students studying in China has been increasing dramatically. Likewise, there are many Chinese studying in the US. This is building a positive network of understanding. China and the US shoulder the enormous responsibility to help the world put peace first, whether it's in the South China Sea or anywhere in the world. The two sides need to find a way to collaborate to make sure peace comes first. Education exchanges between the US and China have long been a key aspect of their relationship, and graduate education has played a particularly large role, accounting for roughly 80 percent of Chinese students studying in the US since education exchanges were reestablished in 1979. Since China liberalized its education market after joining the World Trade Organization in 2001, joint-venture education programs in China have grown rapidly to be an important new aspect of this relationship. In 2013, there were 1,780 such jointly-run institutions and programs with overseas partners. A lot of people worry the confrontation between China and the US will drag us into a cold war. A cold war has three necessary conditions - nuclear weapons, ideological confrontation and the two powers must be isolated from each other. Now there are millions of Americans and Chinese visiting each other. Without isolation, without ideological conflict as the core problem between the two countries, it's difficult for us to go to war. To my understanding, the problem between China and the US over the South China Sea is complicated. It is not only a strategic confrontation. Both sides' ideologies are making things more complicated. On the Chinese side, I want to distinguish nationalism from ultra-leftist ideology. Nationalism emphasizes interests. But ultra-leftists only care about principles - whether the policy is consistent with the principle, rather than whether the policy can gain more interests for China. If you look at Chinese netizens, those people who advocate a tough policy on South China Sea mainly do so out of ultra-leftist principles. On the US side, it's the same. From the perspective of strategic interests, the US needs support from Southeast Asia. But why did the US condemn Philippine President Rodrigo Duterte for human rights issues at this time? That made Duterte agreed to shelve the South China Sea arbitration award for the moment. This phenomenon tells us that policymakers from both sides have given priority to principles. We should encourage both sides to think from the perspective of strategic interests, rather than ideology. The US and China are approaching the South China Sea based on very different principles. The US' principle is freedom of navigation, while China's is sovereignty. If you talk to US military commanders of Pacific Command, both active and retired, they describe the South China Sea as a manageable issue. I am very encouraged to see the fact that China and the US were able to arrange a code for unplanned encounters at sea, and also air to air, to try to avoid another EP-3 incident. On the other hand, this is clearly a test of will, I guess I'll have to think about it as the game of chicken. That sometimes looks like the issue of surveillance flights and navy ships (from the US and China in the South China Sea). US navy people will say, well, we cannot back down from the 12 miles limit, because if we back down one mile, we might as well back down 10 miles, or 100 miles. I am quite concerned about response of US citizens to globalization. The Trans-Pacific Partnership might not pass, which might undermine the US position in the region. More than that, because of the prolonged conflicts in Afghanistan, Iraq and Syria, I think there is an exhaustion, which is also driven by concerns about jobs, the loss of old-style employment. Domestic support for the US global presence is being questioned. A lot of problems are related to fishing disputes. The Philippines complains that its fishermen can't go to their traditional fishing waters near the Huangyan Island. It is urgent for us to find a way to solve the problem. This can be a starting point for us to set a basis for further cooperation. It may be difficult today, but comparatively speaking, fisheries are a less difficult issue. My question is, can the US side help start negotiations and set up a mechanism for fishing cooperation? In addition, I think perhaps we focus too much on disputes. When we talk about the South China Sea issue, we always hear three types of language - official, media and private. But after the officials and those who work for the media go home, I don't think they will talk about the South China Sea. They will talk about how much money they save and whether they have enough money to send their children to the US. Recently, I visited the border area between China and Vietnam. The mayor of Pinxiang city of Guangxi Zhuang Autonomous Region told us about the quota system for farmers along the border. Every day, everyone can import or export goods worth of 8,000 yuan ($1,199) from or to other countries without paying import tax. So the farmers share their quotas, organized cooperative societies to do business. They can earn 100 to 200 yuan each day. This is a trend that nobody can reverse. This can also be the base of cooperation between China and the US. The problem is the US and China face each other across four flashpoints in East Asia - the Korean Peninsula, the South China Sea, the East China Sea and Taiwan. If conflicts break out in any one of these four flashpoints, you are not going to have vertical escalation, the conflict will spread to other theaters through East Asia. The first step that could be done is China demilitarizes and the US agrees to do less patrolling for freedom of navigation. If it is not done soon, I am afraid of the scope for accidental miscalculation, as the risk is getting to the point where it's almost unpredictable. Freedom of navigation is largely a military term. China is the No.1 trading power, so there's no way China would impede the freedom of navigation. For China, this term is a legal instrument to stop the US from maintaining free military access. Demilitarization is always mentioned, but the problem is, so far there is no consensus on how to define militarization. We have totally different explanations. For Beijing, militarization is not turning the reclaimed features into the island base. In the US term, demilitarization is no defense equipment or facilities at all. We need a middle ground.